It’s Sunday morning and I waiting for my coffee to brew. Gooding is crashed on my couch, he usually stays at my place when he comes through Wichita with his band The Angel/Devil. He got in at 4:30am after his gig. I have no clue how he does it. I stayed up until 2:30 am the night before with A. Friend when we went to see The Angel/Devil and that about killed me…. and the 6 or 7 beers probably didn’t help. Anyway, Gooding is a fantastic friend and artist and he is going to start contributing to Pretty Frank… his screen name will be “Goob”…. I’m excited to see what he has to say, because he is one bright and funny MOFO…. oh, check out his sites… the links are on the right. Last night my dear dear friend Maha and I went to our favorite restaurant Passage to India. She just got back from London where she was a line producer on a “mini- series”. She had a freekin’ blast and I couldn’t be more happy for her. She has always been amazingly talented and I think this may be her “calling”. *Fuel, you will no longer be the only “bride” on PF!!! Anyway, this is all good news. Welcome Goob and Maha (Patoonia Boom Boom)!! HOW DO YOU FEEL TODAY…. 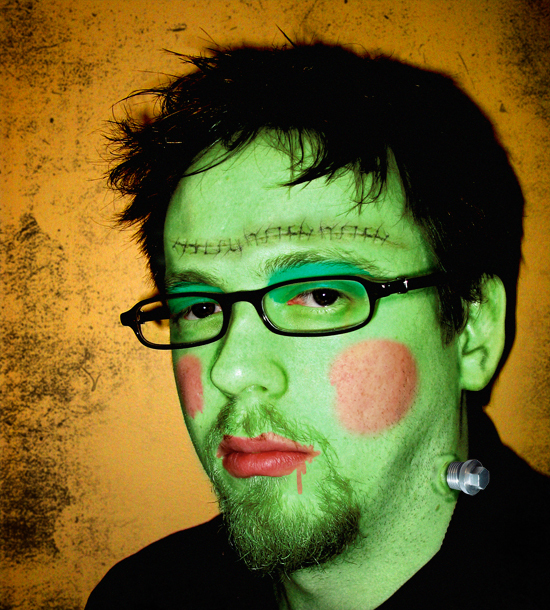 The Frankenstein Monster was abandoned by his creator. He was left frightened and alone. He was an outcast. He was completely unaware of who or what he was. He had no name. No home. No identity. He sought affection and understanding but his disfigured appearance inspired revulsion and fear from everyone he encountered. Despite all of his attempts to find his place in society he found that he would never be accepted by his fellow man. He sought to discover his humanity, but his fellow man rejected him and labeled him a monster and a demon. At the end the monster reverted back to his savage roots and sought to destroy his creator and everything he held dear. 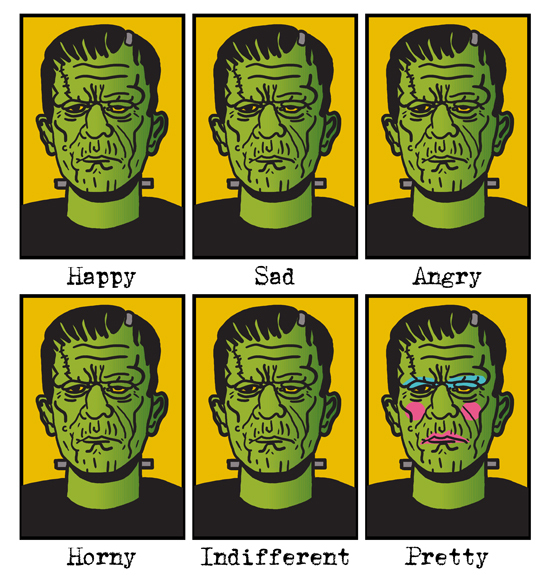 In many ways the Frankenstein Monster represents all of us. We are all seeking to discover our humanity. Discover love. Discover understanding. Discover inner peace. But we fear each other. We fear ourselves. We fear life and death and the unknown. We fear change. We fear fire. We fear art. So the Frankenstein Monster represents the best and worst of us. 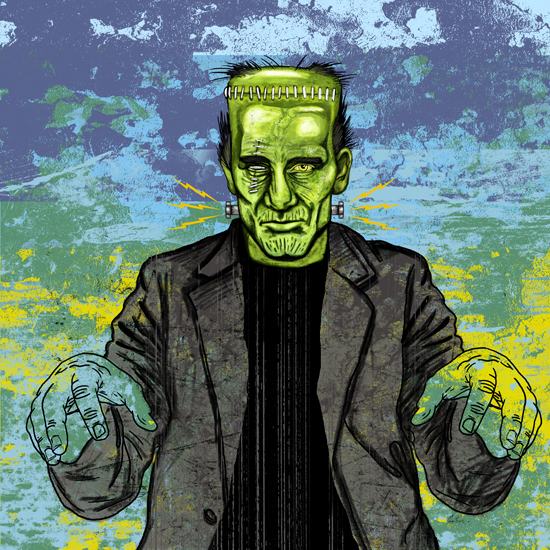 And while we are on the subject of Frankenstein, Here is an update on the new digital painting I’m working on. I hope to have it finished this weekend.